Our multidisciplinary team integrates collectively several decades of research experience in the Pharma and Biotech industry, ensuring the application of industry standards of quality, efficiency, transparency and commitment to respond to the objectives of our partners. Olga Genilloud obtained her Ph.D. in Chemistry (Biochemistry and Molecular Genetics, 1988) from the Universidad Complutense of Madrid, Spain. She has an extended research experience in the academic environment from her work in the biosynthesis of antibiotic peptides (Hospital Ramón y Cajal, Madrid 1984-1988; Harvard Medical School, Boston, 1987). In 1989 she joined the Centro de Investigación Básica de España (CIBE), at Merck Sharp and Dohme in Spain, developing for 19 years leading positions in the discovery of bacterial natural products, 10 years as Head of the Bacterial Microbiology Group. In February 2009 she was appointed Scientific Director of Fundación MEDINA where she leads the research center research and the international opportunities with academic and industrial sectors, and heads the Microbiology Department. She has extended experience in the coordination of multidisciplinary teams, and management of international research programs and collaborations. She has an extended list of publications, with more than 100 peer reviewed articles and book chapters, and 18 patents derived from her contributions to the discovery of novel compounds and the development of new molecular tools in Natural Products research. Diego Pozas obtained a Bachelor Degree in Economics from the University of Granada, and a National Diploma in Business Administration and International Marketing in Ireland. He has experience in marketing and IT consultancy in several companies of different sectors in Spain. In the last years, he had positions in SME’s management, being especially focused on the strategic and financial management, business development, launching of new products and brands in Europe and USA, professional services, consumer goods and food and beverage companies. His financial background and marketing skills give him a broad vision in business administration. Francisca Vicente holds a Ph.D. in Biology (Molecular Biology, 1986) from the Universidad Autónoma of Madrid. Her scientific interest is focused on the research of innovative drugs and she has extensive research experience in the academic and hospital environment (Ramon y Cajal Hospital, Madrid, Institute Pasteur, France). In 1988, she joined the Center for Basic Research at Merck Sharp and Dohme of Spain, (CIBE), where she led for over 20 years a drug discovery program from natural products. Since 2009 she is Head of the Screening and New Targets Department of Fundación MEDINA where she leads a group of 10 scientists working on the screening of microbial extracts from natural products or synthetic compounds, target validation and the discovery of new metabolomic biomarkers. She has coordinated the management of multidisciplinary research groups, participated in national and international scientific projects in collaboration with companies and public entities. She is the author of more than 100 peer-reviewed articles published in scientific journals, monographs and 17 international patents related to the discovery of novel bioactive natural products. Fernando Reyes received his Ph.D. in Organic Chemistry from the University of Granada in 1995 and did a post-doctoral stage with Prof. Chris Abell at the University of Cambridge focused on the synthesis of potential inhibitors of the shikimate and pantothenate pathways. Over the last 18 years, he has conducted research on the isolation and structural elucidation of bioactive natural products for companies and institutions such as Smithkline Beecham, PharmaMar and MEDINA, with a special contribution to the isolation of marine bioactive metabolites, including PM184 currently in Phase II breast cancer clinical trials at Pharmamar. He joined MEDINA in September 2010 as Head of the Chemistry Department to lead the isolation and structural characterization of bioactive metabolites from microbial sources, and the development of new fast dereplication strategies for natural products known compounds. He has published more than 60 peer-reviewed articles, two book chapters, and is named inventor in 14 international patents. José Rubén Tormo obtained his PhD in Pharmacy, worked for Merck Sharp and Dohme and Valentia BioPharma gaining international experience in the design and implementation of global standard operation procedures for pharmaceutical and biotechnology screening laboratories. His wide professional and academic knowledge in biology, biochemistry, natural product chemistry, pharmacology, screening and automation position him as the Collection management expert at MEDINA. Jesús Martín obtained his Bachelor’s degree in Chemistry and worked for Merck Sharp and Dohme de España and at Merck & Co. research center in Rahway, New Jersey (USA). He joined MEDINA in 2009 as head of the natural product de-replication. He is a specialist in MS interpretation, LC-MS instrumentalist, software development, databases maintenance and scientific data mining with a broad knowledge of programming and instrument integration. Ignacio Pérez-Victoria obtained his PhD in Chemistry and Advanced Studies Diploma in Organic and Pharmaceutical Chemistry. He worked for Puleva Biotech and for the Institute of Parasitology and Biomedicine “López-Neyra". He had post-doctoral positions at the University of Twente (Netherlands) and the Chemistry Department of the University of Oxford. Javier Ortiz obtained his Ph.D. in Organic Chemistry, he has over 12 years of R&D experience in drug discovery, organic synthesis, medicinal chemistry, chemical biology, computational chemistry and natural product chemistry and a strong background in organic synthesis, modern analytical spectroscopic techniques, High Througput chemistry and bioconjugate chemistry. Gloria Crespo acquired her Bachelor’s degree in Chemistry and has 11 years of experience in Natural Product Chemistry. She worked previously at Pharmamar and at MEDINA she is specialist in the isolation, purification and structural elucidation of bioactive natural products. She is currently developing her PhD Thesis, and she is coauthor of 3 patents and several congress posters and publications. Ignacio González has a PhD in Biochemistry and Molecular Biology and a Master degree in Microbiology. He worked for Merck, Sharp & Dohme de España at the Basic Research Centre (CIBE), developing a extended expertise in microbiological techniques, gas chromatography, PCR fingerprinting, DNA sequencing analysis, and biochemical and microbiological assays. He is coauthor of 11 papers, 1 patent and 21 congress posters. Daniel Oves obtained his PhD in chemistry, has over 10 years of experience in the chemistry and biology of natural products, worked with Prof. Challis' group at the University of Warwick (UK) on the characterization of microbial secondary metabolite pathways. 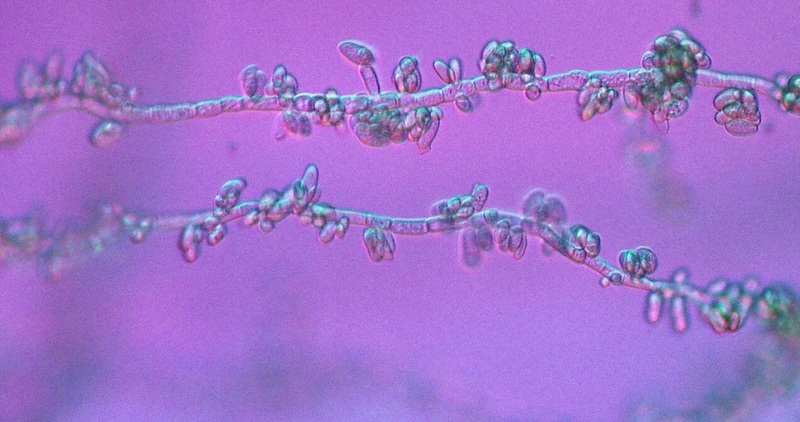 He is expert in developing approaches to unleash the biosynthetic potential of actinomycetes. He is coauthor of 13 papers and 2 book chapters. Marina Sánchez, obtained her PhD in Microbiology. After working in Dr. Maqueda’s Lab at the University of Granada, and with Prof. Salas’ group at the University of Oviedo, she specialized in Molecular Biology, Microbiology, Metagenomics, Antimicrobial compounds, Proteomics. She leads the microbial genome mining approaches for the discovery of secondary metabolites at MEDINA, and she is also coauthor of 13 papers and 2 book chapters. Victor González obtained his Bachelor's degree in Environmental Sciences and a Master degree in Biotechnology. He has a first-hand experience in mycology and the development and set up of microbiological target based assays, fermentation scale-up, isolation, PCR fingerprinting, DNA sequencing, metabolomics and phylogeny of Fungi. He focuses his work at MEDINA on the identification and typing of Fungi, and he is currently developing his PhD Thesis. He has coauthored 16 papers, 4 patents and several congress posters and oral communications. Bastien Cautain obtained his Ph.D. in Immunology and physiopathology, he worked for the Institut Jacques Monod and CNIO-Lilly laboratory. He has specific knowledge of the activity of small molecules in tumorigenesis and inflammatory processes and he is experienced in target inhibition and drug exposure, test development for drug screening, development of cancer models for efficacy study and target validation in vitro and in vivo. Carmen Ramos obtained his Ph.D. in Biochemistry and Molecular Biology from the Autonomous University of Madrid where she worked in Centre of Molecular Biology “Severo Ochoa” (UAM/CSIC) on the molecular basis of neurodegenerative diseases. Subsequently, she worked for nine years at Neuron Bio, generating research cell models in neurodegeneratives diseases for discovering new drugs and targets. At MEDINA, she is developing drug screening programs in the field of neuronal diseases, efficacy studies and target validation in vitro and in vivo. José Pérez del Palacio has a Bachelor’s Degree in Biology and specialized in biochemistry and drug discover. He worked for Merck Sharp & Dohme de España and has a broad knowledge of high throughput screening technologies, biochemical assays, analytical methods development for HPLC, LC/MS/MS, GC and GC/MS systems. He is the author of several papers, scientific posters and presentations at international conferences and congresses. Mercedes de la Cruz Moreno has a Bachelor’s Degree in Chemistry and worked for Merck Sharp and Dohme de España where she contributed actively to the discovery of new antibiotics. She is responsible for both agar and liquid antimicrobial assay formats at MEDINA. She is co-author of 21 scientific publications and 29 scientific posters and presentations. Caridad Díaz has a Bachelor's degree in Biochemistry and Biology, she is specialized in the development of analytical methods for liquid chromatography coupled to mass spectrometry. She also has a broad experience in drug discovery and preclinical safety and has achieved great knowledge in metabolomic analysis. Pilar Sánchez has a Bachelor´s degree in Chemistry, and joined MEDINA in 2013. She has previous experience in Microbiology, Biotechnology and Immunology working at the Clinical Hospital of Granada, Agri-food Laboratory and Fibao. Germán Martínez obtained his degree in Information Technology at the University of Cáceres, worked on projects aimed at large companies such as Telefónica I+D, Endesa and Acciona, acquiring an extensive experience in designing applications and improving existing systems. Teresa Sánchez obtained her Bachelor’s Degree in Business Administration, she spent a year at the University of Hes–Iser in Rotterdam, worked for PwC (PricewaterhouseCoopers) and for the EASP (Andalusian Public Health School). She is specialized in auditing, business planning, financial management and accounting.